corporate social responsibility | Raven Hydronic Supply Ltd.
Primary school students at a Room to Read school in Chalinze, Tanzania. Raven Supply is thrilled to announce that this year, we raised $24,000 for literacy charity Room to Read thanks to the generous support of our customers and vendors. These funds exceeded our initial goal of $20,000, and will be used to send 60 girls to school in developing countries around the world. Not only will this have a direct impact on the day-to-day lives of these girls, but this education will give them the tools to lift themselves out of poverty, contribute financially to their families, and avoid early marriages. According to the World Health Organization, for each year a girl attends school, her future earnings increase by 11%. Throughout 2018, Raven Supply offered our vendors the chance to join us in supporting Room to Read. They have more than stepped up to this challenge by providing regular discounts on final invoicing prices for goods and services. We took these savings and rolled them directly into these fundraising efforts. Not only that, but our remarkable community of customers made donations in many sizes, and we couldn’t help but to be inspired to match these contributions dollar for dollar. Raven Supply has supported the work of Room to Read since 2013. This exceptional charity supports children’s literacy in 16 countries including India, Nepal, Vietnam, Cambodia, and Tanzania. 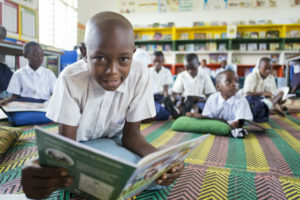 Room to Read’s data informed approach to literacy programming includes opening school libraries, producing in-language children’s books, funding student scholarships and uniforms, and giving local young people leadership training so that they can advocate for girls’ education in their communities. 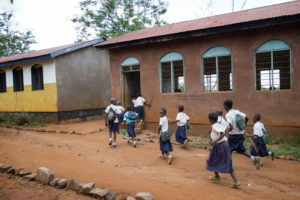 Students run to class at a Room to Read school in Mindutulieni, Tanzania. In May 2019, our Project Engineer Linna Luu will travel to Tanzania to see Room to Read in action. During her trip she’ll spend time at a Room to Read school and get to know some of the girls participating in literacy and leadership programs there. We will be sure to share the story of her incredible trip here on our blog. To date, with your support, Raven Supply has contributed over $170,000 to Room to Read projects. We sincerely thank you for your generosity, and look forward to announcing our 2019 fundraising efforts soon!